Primary school students have the chance to share their vision for Western Sydney Airport through an innovative design competition. Prizes worth $40,000 will be up for grabs, which can be spent on science and technology projects at their school. To win students will have to tackle some of the real world challenges involved in creating such a significant piece of infrastructure and create their answers using the widely popular electronic building blocks game of Minecraft. The competition, which is coordinated by the NSW Department of Education, Minecraft and Liverpool City Council is now in its second year. Western Sydney Airport (WSA) has come on board as a new gold sponsor this time around. “We are delighted to support such an exciting learning opportunity for the students of Western Sydney,” says WSA chief executive officer Graham Millett. “These primary school students will be finishing school the year the airport opens. It’s exciting to think that many may one day be working at the airport. The NSW Department of Education and Minecraft will run free professional learning days for teachers at Campbelltown, Liverpool, Penrith and Parramatta. These sessions will be hosted at the city campuses of Western Sydney University (WSU), which is a supporter of the competition. Teacher training will take place in March, with students working on their entries throughout Term 2. Entries are invited from all Western Sydney primary schools. Students will submit their entries online. The top schools will then be invited to present their ideas at an open session at WSU’s Liverpool campus in August before a judging panel of industry experts. “We are so proud of the success of the Minecraft Design competition,” says Liverpool Mayor Wendy Waller, pictured below with teachers and students from 2018 winning school Dalmeny Public. “We launched it last year at a local level because we saw the importance of connecting the students of today with the opportunities the new airport would create. We had hundreds of students from 12 schools involved and our competition was highlighted on Minecraft’s global education site. 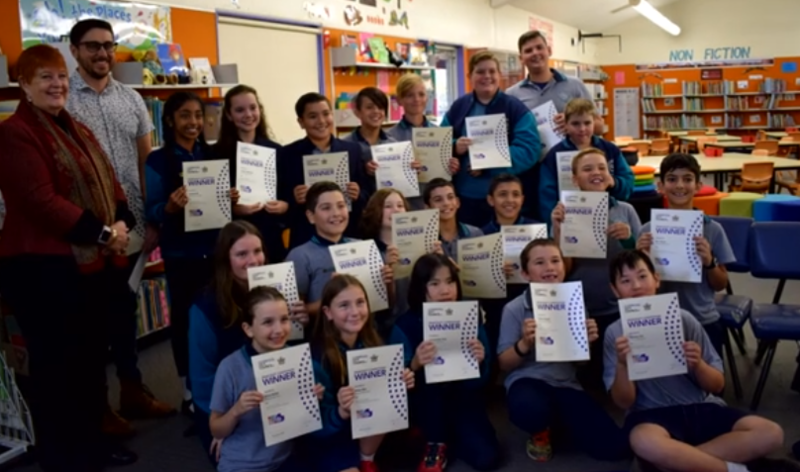 Dalmeny Public teacher Daniel Melissari, who facilitated the winning entry in 2018, said his students will be very keen to try and retain their crown this year as they take on students from across the West. “Last year I just set them up with the technology they needed and let them run wild. They created the magic,” he said. “I had a lot of fun watching them doing it. Their enthusiasm was incredible. They worked on it every single break. They loved it and thought it was the best thing ever.